Christopher Kane - Christopher Kane draws inspiration from the effortless sensuality of Marilyn Monroe for his SS19 collection, resulting in unconventionally alluring pieces such as this white jersey bodycon dress from the runway show. 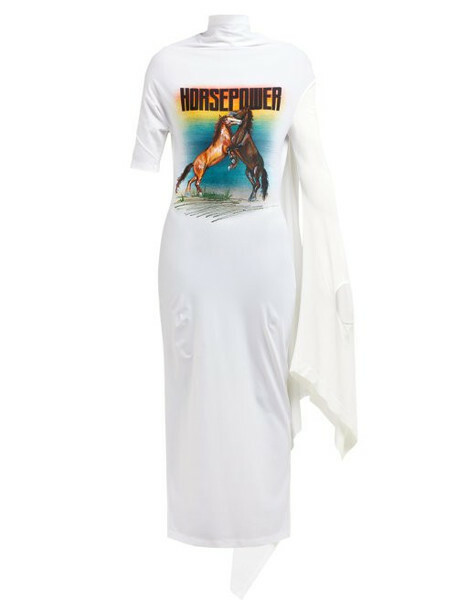 It's shaped with a high neck, asymmetric sleeves and a second-skin fit printed with a graphic 'Horsepower' motif, while the low open back is fastened with black grosgrain ribbons. Wear it with chunky leather boots for a subversive finish.